Mmmm-mmmm! Has anything ever sounded more delicious? 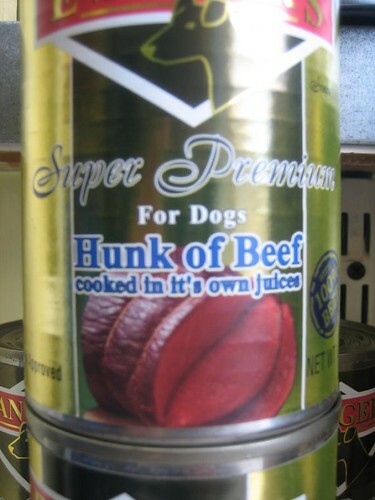 But why describe it as "cooked in its own juices"? Doesn't that just mean baked? Or roasted? Wouldn't it have been more compelling to call it roast beef? At least until you notice the section further round that notes it's "in loaf form." Yuuuum-meeee! What caught my eye, of course, wasn't the utterly unappetizing description. but rather the big fat apostrophe right there in the middle of the can. I guess they assume dogs don't care about punctuation. 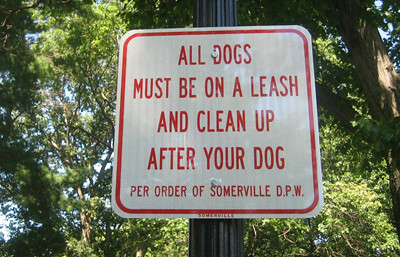 Of course I understand what it means, but the literal translation is all dogs must be on a leash, and all dogs must clean up after your dog. I'm all for community collaboration and equality of responsibility, but I have trouble believing that the dogs that, um, patronize this patch of greenspace will start carrying plastic bags and pooper scoopers. Not with all the squirrels distracting them. Copyeditor General's ruling: If dogs are going to the trouble of learning English, the least we can do is lead by example.